WASHINGTON - Actor Edward G. Robinson, best known for his memorable film roles as a gangster, will be honored Oct. 24 when a new commemorative postage stamp is issued by the U.S. Postal Service in conjunction with AFI Fest 2000, an international film festival hosted by the American Film Institute. "As one of America's most beloved 'tough guys,' Edward G. Robinson developed an unforgettable on-screen persona that belied his gentle, quiet nature. His contributions to the golden age of film make him a fitting candidate for the Legends of Hollywood stamp series," said Karl Malden, actor and member of the Citizens' Stamp Advisory Committee, who will dedicate the stamp. The official first day of issue ceremony for the Edward G. Robinson stamp will be held at 10 a.m. (PT) in the historic Egyptian Theatre at 6712 Hollywood Blvd. in Los Angeles, Calif. The ceremony is free and open to the public. Joining Malden at the dedication ceremony will be Tirso del Junco, M.D., a member of the presidentially appointed Board of Governors of the Postal Service; Robinson's granddaughter, Francesca Robinson Sanchez; and Hollywood stars Charlton Heston, Nanette Fabray, Florence Henderson, Norman Lloyd, Janet Leigh and Shirley Jones, among others. AFI Fest 2000 runs Oct. 19--26. The Robinson stamp dedication will be the lead event on Oct. 24. A screening of the classic 1965 film "The Cincinnati Kid," starring Robinson, Malden, Steve McQueen and Ann-Margret, will immediately follow the event. 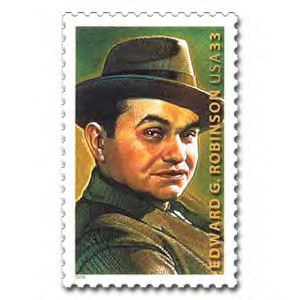 The Edward G. Robinson stamp will be available at the Egyptian Theatre Oct. 24 through the end of AFI Fest 2000. In addition, the Postal Service will offer a special AFI Fest 2000 pictorial cancellation and cachet envelope. The stamp will also be available at Los Angeles post offices starting on Oct. 24 and at post offices across the country beginning on the following day. Robinson is the sixth honoree in the Legends of Hollywood stamp series, which also highlights the achievements of Marilyn Monroe (1995), James Dean (1996), Humphrey Bogart (1997), Alfred Hitchcock (1998) and James Cagney (1999). Born Emanuel Goldenberg in Romania in 1893, Robinson appeared in some 90 films, including "Double Indemnity" (1944), "Key Largo" (1948) and "The Ten Commandments" (1956). He immigrated to the United States with his family when he was a young boy. In 1913 he began his professional acting career, working in theater for many years and eventually moving into film. Robinson is best remembered for his classic portrayals of gangsters in "Little Caesar" (1931) and several other films. His versatile acting career continued with numerous roles in film and television until his death in 1973. Shortly before he died, Robinson received an Academy Award for lifetime achievement in films. Robinson was also known as a philanthropist, humanitarian and art collector. In addition, he was a top radio personality and accomplished public speaker. The stamp art by Drew Struzan of Pasadena, Calif., is based on a black-and-white photograph of Robinson taken by Elmer Fryer. Howard Paine of Delaplane, Va., was the art director for the stamp. The photograph appearing on the selvage of the pane of 20 stamps is a black-and-white publicity still from the Warner Bros. film "Five Star Final" (1931), in which Robinson played a tough newspaper editor.